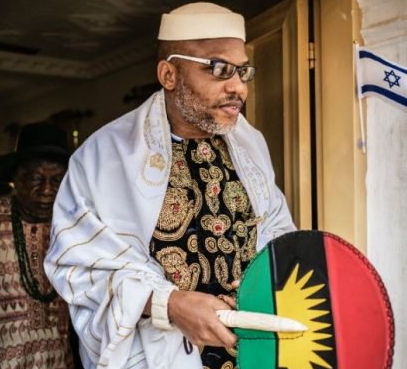 If you haven’t watched the latest Nnamdi Kanu video trending in the social media, you must be one of the lucky few whose firewalls have held firmly against hate-filled garbage daily spewed out of the social media. Even then, for the hordes of Nigerian netizens familiar with his video-casts particularly his unflattering characterization of the country as a zoo and fellow citizens as baboons, it must come as a new one that the infantile, hate-filled rant of the individual who was at best an unknown quantity, or, if you like, a gadfly – until the Buhari administration unintentionally thrust him into the centre of the firestorm of nationalist agitations –recognise no boundaries between the sacred and the profane. Clearly, if the video is any window into the mind of the individual who obviously thinks the best way to the heart of his people is to denigrate every other group in the Nigerian federation, the greater tragedy must be the delusion it feeds his hordes of followers on his Biafra project. In a country where ethnocentrism is the way we live and have our being, the putative leader of the secessionist agitation would ordinarily seem to have said nothing new that has not been said by different groups making up the federation. Let no one remind yours truly about the infamous allegory about the ‘dogs and baboons’ being soaked in blood’ credited to then then General Muhammadu Buhari, the presidential candidate of the Congress for Progressive Change, CPC, in the aftermath of the massively rigged 2011 elections; or even the royal threat to herd the Igbos into the Lagoon in the heat of electioneering – both of which I insist are as dissimilar as far as context would go – there is something particularly noxious about this supremacist mind-set of the emergency rabbi that demands close scrutiny. Fine, it is just as well that the IPOB Supremo is riding the crest of popularity at the moment. After all, he literally shut down the economy of the South-east on May 30. If there is any doubt about his extensive his hold on his followers, just imagine how his little-known Isiama Afara community in Umuahia, Abia State has transformed to a Mecca of sorts since he was admitted to bail. Add to that the fawning adulation by his hordes of courtiers, the high profile visitations and the orchestrated photo-ops with the high and the mighty in the South-east, the man is unmistakably having ball. Earlier on, I have talked about his empty bombast; the treasonable activities and not least, his ethnic baiting. Welcome to the new Igbo exceptionalism – all of these thanks to the budding Eze Gburugburu! Beyond the raw anger, in vain have yours truly sought for any coherence in thought about his idea or his vision for his dream republic. So badly does he want his Biafra Republic that dissent or civility is deemed treasonable. It is either his Biafra or death (?). The other day, I watched one of his celebrated videos on You Tube. A group of Igbos in United States had gathered to interrogate him on the feasibility of his pet project amidst his grandiose claims about his stock of weaponry and other logistics only to be subjected to a brutal putdown all because they dared to ask hard, probing questions on a project which requires all to come on board! If I came away with the impression that the man either suffers from what psychologists call delusion of grandeur or is an outright fraud, his worst form of uncivility would be reserved for groups outside his Igbo kith and kin – groups that his Biafra had built strong relationships many of which predated the colonial contact, right up to the contraption now deemed loathsome. As far as Kanu and company were concerned, they were at best expendables or worse, mere fodders in his dream project of Biafra. Ever heard of exceptionable xenophobia? It’s a brand new world of delinquency! Where do we go from here? If I may again borrow the Biblical expression – our fathers may have eaten the sour grapes; it is we, the children’s teeth that are set on the edge. Today, the wages of poor leadership are in full bloom, the country seems set to reap the wages of abdication in full. From the Biafrexit sing-song of the South-easterners, a new chant from the North proclaiming Biafra-must-go has since taken over. Not to be outdone in the secessionist quest, a brand new group in the South-west has since proclaimed its own Oduduwa Republic. Next is perhaps the Niger Delta republic. There is no telling where the next secessionist group will come from. From resource control, to restructuring and now to free-for-all secession; the Nigerian disease would appear to have fully metastasised. Where will the Mutually Assured Destruction (MAD) quest end? I ask: how will the labelling of groups advance the Biafra quest? The scripture is no doubt right: Woe to you, O land, when your king is a child, and your princes feast in the morning? It is sadly the case that our elders are left to mumble in their bedchambers while infants – proclaiming themselves as leaders – strut the land. Why should a Nnamdi Kanu not take the centre-stage in the absence of the restraining voices of the elders of the region? I am not talking of elders like Ango Abdullahi, who would instinctively jump behind some misguided northern youths seeking to expel other Nigerians from their abodes; or others like Ben Nwabueze who would struggle, valiantly, to find accommodation for the objectionable methods of Kanu and co. I have nothing against the Biafran agitation. Like I said, I am all for it provided it is about redressing all the imbalances and the in-built injustices that have hobbled all attempts to create a just and equitable federation. Call it restructuring or fiscal federalism or whatever; so long as it is about good governance, optimal delivery of services and more transparent utilisation of national resources, the nomenclature would matter only a little. What I find detestable is the clanging babel of secessionist voices claiming to speak for the rest of us; their crude and opportunistic appropriation of the peoples’ desire for justice and equity for narcissistic ends. You could have used more simpler terms if you want your point understood by majority of Nigerians. It’s clear you have something against Biafrans in general instead of pointing at Kanu in particular over what he said (NO DOUBT HIS STATEMENT WENT OVERBOARD COS POINTING ABOUT YORUBA PASTORS ALONE MADE HIM WRONG,INFACT THE ONES FROM BIAFRA LAND ARE MORE DEADLY), he is a human and can make a mistake while delivering his speech or answering, the circumstances about Nigeria and the system of leadership for the past 50 something years will make any patriotic individual spew out venom, the only achievement is building churches here and there, even exporting them, not to be preaching the good news,but an industry to be collecting money from the gullible ones, and this is result of a failed leadership and Nation. I have to agree with your last paragraph,but again, i want you to understand that freedom fighters are not politicians, they always like to liberate and let the moderate ones lead. With reference to the Holy Book, Bible, no man can provide the peace and unity we all clamor for, except GOD himself and that’s probably in the next life. Haba Lawrence! How can you vividly remember what never happened? Kanu called Jonathan names prior to the elections, only he was harder on Buhari. Have u ever wondered why Igbos thrives majorly in buying and selling? because they have Zero patience for the complexity of Industry, they are always in a hurry leaving no time for thinking. Yorubas were in opposition for 16yrs yet they endured, now Igbos in opposition for less than 2yrs are outdoing themselves to decamp to the ruling party,any wonder why their Youths can’t see through Kanu’s shenanigans and stupidity? @WALE, IT IS sad to know how purposeless your comment is! What manner of rash statement is this that the Igbos have zero patience? Do you know what it takes to grow a business from the scratch? Do you know what dues that somebody like Innoson had to pay before getting to this height he rides now? What complexities are you talking about that you feel you understand so well to pontificate about? It is far better to speak and confuse other people than speaking and confusing yourself. Hate on hater. Who cares? POSTER YOU CAN SAY WHATEVER YOU LIKE WITH YOUR MOUTH. BUT WHOEVER THAT SAY THAT THE WAY AND MANNER IGBOS ARE BEING TREATED IN NIGERIA IS GOOD, LET GOD ALMIGHTY TREAT THE PERSON/PERSONS THE SAME WAY, AMEN!!! This is how isis and Boko Haram strted .all I see,smell and hear is hate hate hate namadi is not to be trusted.i am proudly lgbo but this one I don’t like and won’t buy from. The writer of this article, Mr. Sanya Oni, it has been revealed that this Nnamdi of a person made this remark in 2014 in answer to a question. Please let us all find ways to douse tension in the land by the unjust treatment of the Ibos brought about by one section of the country refer to themselves as “born to rule”. What is the intention of whosoever published this article now that the polity is boiling?. The main aim of the Arewa youths may not be against the Ibos but only trying to use it to bring the military back to power. Acting president Osinbajo will become the president if anything happens to Buhari and the Northern cabal don’t want it. Secondly, they do not want restructuring as the rest of the country have been clamoring for it. They want to do everything to bring crisis in the country. Was it not about a week or so ago there were rumors of military officers planning a coup? Did the chief of army staff not arrest some officers? Something to think about. God save Nigeria. A WISE COMMENT FROM YOU! Did I hear you say Kanu is a freedom fighter? Yes he could but certainly not in Nigeria where apartheid or any form of enslavement exists. With this in mind, Kanu and his co-travellers in the Biafra agitation are mere shadow chasers. Freedom fighter for an ethnic extraction that freely migrates, lives and trade in all parts of and outside the country. Kanu Nnamdi is nothing but an animal living in human body. “The greyhound who refuses to listen to the voice of the hunter always die untimely and a shameful death.” He is a foolish, arrogant, lazy, and jobless individuals preying on some few ignorance Igbos that are following a blind and bitter idiot to their self-destruction. I want say here that majority of the reasonable and good Igbo working people are loving and peaceful, and are not on board with his degrading and insulting other Nigerian tribes. The Yorubas, Ijaws, Isekiris and Hausa Fulani cannot be blame for lack of development in the Southeast region due to corruption and looting of their funds by their own people. Again, we-Yorubas are not preventing the Igbo people from leaving other regions of the country to form their Biafra nation. But for foolish and dumb Kanu to be raining insults and degrading words on other Nigerians who tolerate and allow over 70% of Ndiigbo to flourish, trade and live in the north, Southwest, and Southsouth is the peak of insanity. This is how Col. Emeka Ojukwu gradually led the Igbo to the first civil war because of intolerance, greed, and ultimate quest to dominate other Nigerians in the 1966 Igbo coup when the Igbo soldiers killed Hausa Fulani and Yoruba political leaders while sparing the lives of Opara, Nnamdi Azikwe, and other prominent Igbo leaders in the First Republic. In the end, Chukuemeka Ojukwu ran away with his entire family from the war zone, and watched over 3.1 millions Igbo perished in the war he started or created. What a shame! This 419 crook called Kanu is currently leading a team of haters, brainwashed fools, and losers that have no knowledge of anything and decided to follow criminal and an hater as their leader. Crook and criminal leading associations of fools. If this crook and core hater is now Igbo freedom fighter, then I’m so sorry for the retire Igbo tribe. The fact is that Col. Ojukwu was a Carrer military official who used his father’s wealth to weigh a failed, but he was not a begger, and a clueless idiot who is selling tribalism and hatred for living. He goes around begging dumb Igbo people for money to finance his lavish lifestyle. We-Yorubas are not preventing any group or tribe from suceeding, but we believe that every Nigerian regardless of his or her tribe should be free to live, work, and choose any region of Nigeria as his or her home. Igbo people have all to lose with nothing to gain if some foolish among them still listen and worship moron like Kanu Nnamdi. This idiot will eventually turn the good Igbo people against all other Nigerians with his senseless and rediculious statements and utterances. To my Igbo brothers and sisters who are living in the north, Southwest, and other part of the nation outside the Southeast, we must all come together to denounce this moron from promoting tribalism, tribal tension, and his calls for unnecessary war. This guy is nothing but a big fool that should be return back to Lagos or Abuja Maximum prison without any trial. An animal like him should never be allowed to live among noble men. Shikenah! I am a Biafra, my wife is from Yoruba land, her mother took me like her son after the death of my mother, her father is my father, please who ever write this article should please clean it up because Yoruba’s are very good to me, to all, they welcome everybody with open hand, I knew that they will not react negatively on this writer up, because they are well educated people and should not be compared with the cow people northern. The Ibos has been living with the yorubas for many decades and both of the tribe should not allow these wicked bold sucking region to pure enmity between them. Thank you omokehinde….dont mind that idiot.. As for biafra…they will wait the Jesus come. one thing i hate about this man is that he don’t know how to talk, he talks anyhow and he is too insultive. hate you for that Mr kanu!! TO BE frank, the very first time I tuned my radioset to Radio Biafra, I turned the dial away almost immediately. This was because of the weight of vitriolic words and rancorous avowals that floated from his frequency. If anybody could recall, I had been saying that this Biafra struggle would be better gone about the way that Dr Martin Luther King Jr. fought and won his. To use disrespectful, despicable names and adjectives on your fellow human being in no way makes you a superior being; it rather judges you as same with them, for what you hate, you become. But what you forgive, you forget. Igbos need to forgive whatever wrong they perceive have been done to them by the Hausas or the Yorubas, or by Nigeria for that matter. Grudge is a costly thing to keep. If Biafra comes today, it needs to be at peace with its neighbours; it can’t afford enmity with every single neighbour, otherwise there would be endless wars like what is happening between Israel and Pakistan today. BUT THE QUESTION ABOUT THE NEED TO SECEDE cannot be silenced. This contraption called Nigeria has failed totally, and woefully. I would not hold on to a hope of a better Nigeria when no single attempt is ever made towards that dream. There is pessimism that is prudence; there is optimism that becomes obtuse, and there is faith that becomes folly. Such is the thought that Nigeria would someday rise from its sleeping posture. AND, FOR THE RECORD, I CONDEMN without any reservations every irrational comment he made against Yoruba men of God. God will judge him for that! What diabolic tribalism does he want to introduce in the church? Has he not read in the bible that there is neither Jew nor Greek…for we are all one in Christ Jesus? @omokehinde quite a while. God bless you sir for the comment. @Metu I am not disappointed. Where’s D HUNTER? What percentage of Igbos does this madman even represent, as a full blood igboman, I am in no way represented by these lunatic and every right thinking nwa afor should disassociate with these guy. Marginalization of Igbos is clearly seen by everyone especially by the current regime but inciting Igbos against other tribes is highly uncalled for and should be condemned. There’s always a civilized way of seeking secession and derogatory comments against others isn’t part of it,besides, who is Nnamdi representing ?,because I know we Igbos are in millions with only few gullible ones standing by him. I refuse to be counted among and God bless Nigeria. Bro Omokehinde is a genius who always write sensible articles with good command of English.Thumbs Up for u sir!You have spoken my mind. It’s so unbelievable the level of HATE IGBO’s have towards Yoruba people.